No Comments on Bank Holiday Fundraising Extravaganza! 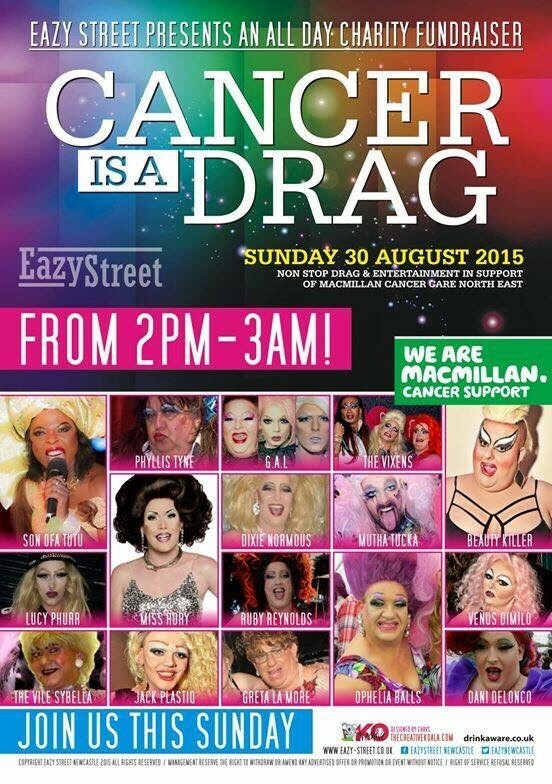 Cancer is a Drag’s Bank Holiday Weekend Fundraising Extravaganza! This weekend we bring you three different fundraisers up and down the country. A whole day of Drag Celebration to celebrate our official launch at Halfway II Heaven 2 years ago on Saturday 24th August 2013. Oh my, how we have grown – and we have lots to celebrate, especially our official registration with The Charity Commission in January of this year (Reg. No. 1160129). It’s now time to start the next leg of our journey supporting people and their families living with cancer and we couldn’t think of a better way than with our Amazing Halfway Family, without whom none of this would have been possible. 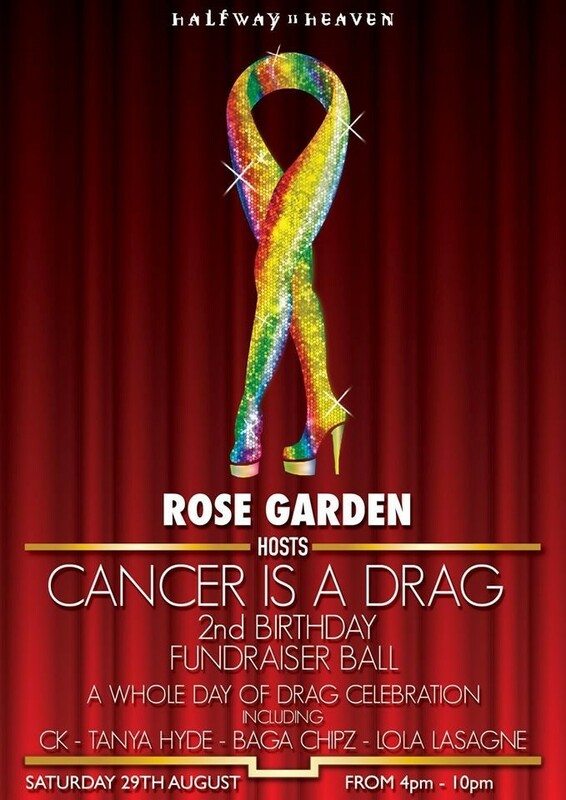 We are very proud to have been contacted recently by Paul Rowe of Eazy Street who was very eager to raise money for Macmillan Cancer Support and wanted to join up with us and hold his first Cancer is a Drag fundraiser in our name. We are so pleased to be spreading our wings and putting a high heel firmly in the North East of England. All monies raised on this special day will be shared equally between Cancer is a Drag & Macmillan Cancer Support through our official fundraising committee. Our amazing supporter and friend Son Ofa Tutu will be hosting the day and there are tons of wonderful local acts and up and coming stars, such as The Vixens, performing for free. We thank Paul and his wonderful team in advance and wish them every success! 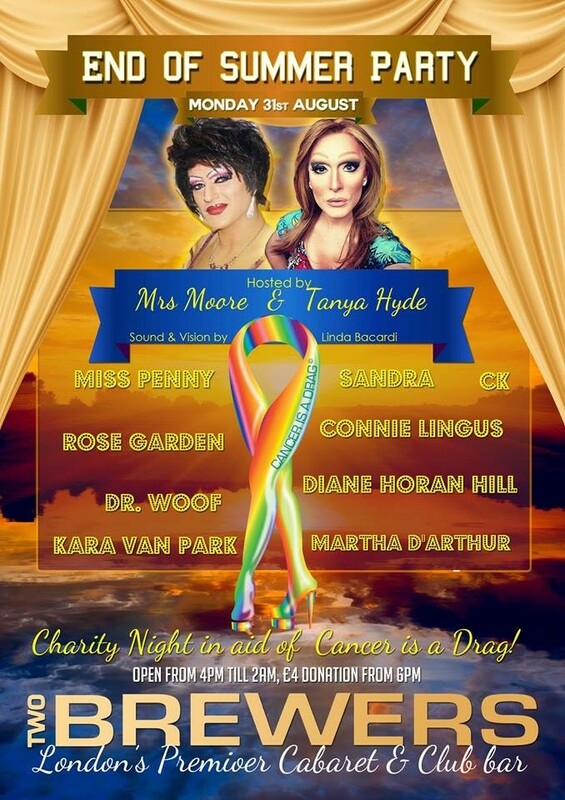 Our gorgeous Attaché Tanya Hyde and partner in crime and avid supporter of our cause Mrs. Moore have organised this fantastic ‘End of Summer Party’ with the ‘cream of the crop’ in Drag Entertainment (and our amazing friend Trindy Aurora had a hand in it too apparently). What better way to spend the official last Bank Holiday of the Year and the ‘end of summer’ at this amazing venue run by our special new friend Jimmy Smith? Top class entertainment, fun, frolics and lots of fundraising to finish off the weekend knowing that some of your loose change went to help someone living with cancer and brought a smile to their face. You never know you could win an amazing raffle prize and be celebrating next weekend too! Have a happy and safe Bank Holiday and we hope to see you somewhere along the way – with special love and thanks for your new or continued support – it really does mean the world to us!